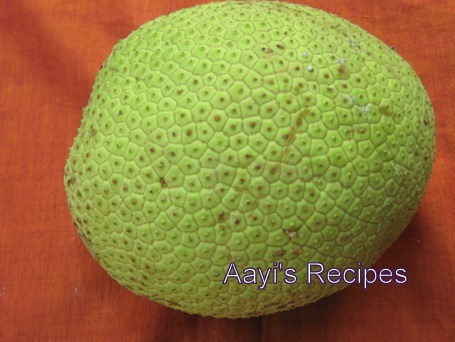 We have a big breadfruit tree in our garden which gives big fruits, sometimes twice a year. My children loved this. We usually share them with our neighbors. Besides preparing randayi, phodis, bhajes and talasani, I prepare these chips very often. They are crispy and tasty when prepared from fully grown up breadfruits. The chips are not prepared from yellow coloured ripe fruits or the ones that fall down. We take out fresh fruits and make the chips. These can be stored and used for many days. Check out chips made from bananas, raw jackfruit, potatoes. Peel off the skin of breadfruit. Cut it into pieces and immerse under water for about ten minutes to remove any gum. 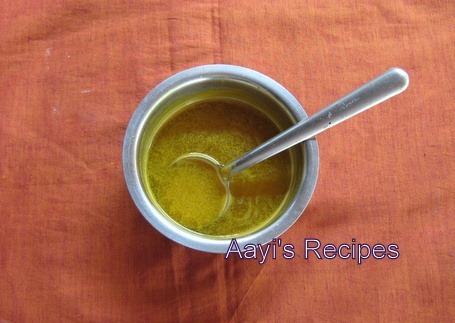 Prepare salt water by adding about 1 tea spn salt to a cup of water and add a little turmeric powder and keep it aside. Make thin slices and deep fry them in oil. When the chips are almost done, add a spoonfull of salt water. Fry till they are completely done. Remove them from the oil. If you want, you can sprinkle chilli powder or pepper powder as per your taste. When they get cooled, store them in an airtight container. My favourite one, i just loved it. How can we preserve the coriander leaves for long days? Cut the thick stems, cover the leaves in a paper towel and keep in fridge. Used to have these all the time when I lived in Samoa, but breadfruit is had to come by in Michigan. We cut them in chunks, soaked them for 10 minutes, cut into chip size, fried them in vegetable oil, drained them on paper towels and salted them for a fantastic treat. I don’t know what breadfruit is, but these sure look yummy. 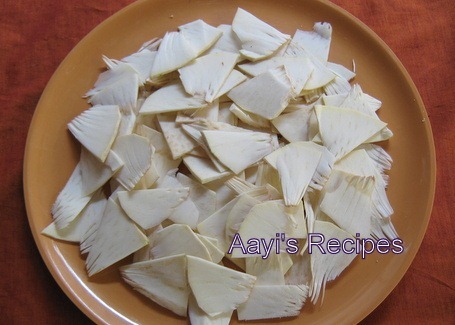 Breadfruit looks similar to jackfruit and I love jackfruit chips. 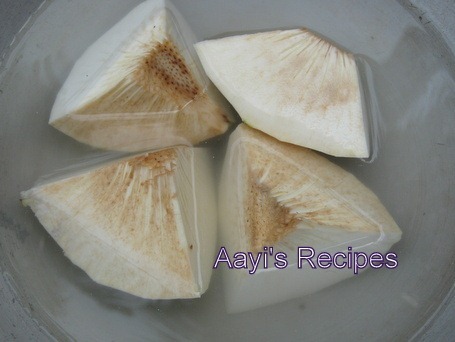 I will try to get hold of a breadfruit, I so badly want to try this. I had never heard of this fruit before! guess i have been missing out.I have a question though, will the oil splutter when I add in the salt water? Oh my… this is my fav after jackfruit chips ! I have heard of this fruit but not seen it. 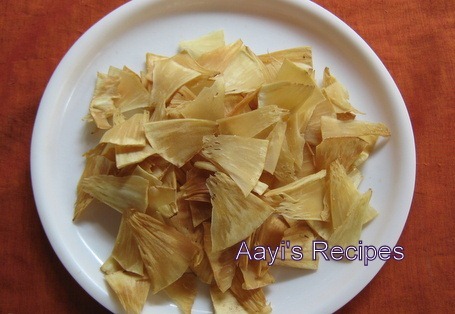 Looks like jackfruit .Chips look so tempting. This is the best chips one will ever eat.. i always wonder why Indians never make them (I lived there for a very long time).. Its very common in my country – Maldives. 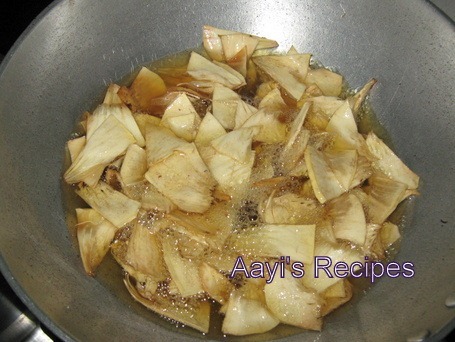 you have told “Make thin slices and deep fry them in oil. When the chips are almost done, add a spoonfull of salt water”..My doubt is where to add the salt water,we have to remove the chips from oil for that and again fry it after adding salt water or what?..can you please explain..
You have to add salted water to hot oil. Oils splatters all over, so be very careful. In Maldives this is a favorite. A very common snack. You don’t necessarily have to add salt water into hot oil we don’t do that and it still tastes good. if you want you can wash the chips in salt water before frying them. If u add salt water in the oil it splatters and is very dangerous in my opinion..